Centipedes are ugly and frightening little pests that make you scream when you see them crawling on your wall. They also have a venomous bite that although won’t kill you (too little venom), will still leave a red, swollen, itchy and painful bump on your skin. However, its venom might be dangerous to persons who are allergic. So, how can you get rid of centipedes with natural, simple, and effective methods so you won’t see them and their many freaky legs ever again? 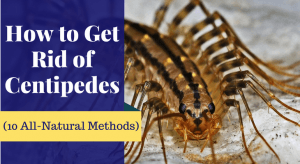 In this article, you will find 10 interesting facts about centipedes that you should know and 10 natural, easy, simple, and proven methods that help you get rid of them without harming you, your family, your pets, or the environment. What are centipedes? And what does its complicated name mean? The word “centipede” comes from Latin (centi- meaning “hundred” and pedis meaning “foot”) and it means “with 100 legs”. As the name says, they are multi-legged creatures. Well, the number of legs vary, as centipedes can have between 17 to 350 pair of legs. Centipedes can be as long as 12 inches, but are usually about 2-3 inches long. Their color ranges from brown to red, but they can also be gray. They are all venomous! Even highly venomous! They inject their venom with a pair of claws. As mentioned, though their bite is not fatal to humans, it causes swelling, pain, itchiness, chills, weakness, and fever. It can trigger an anaphylactic shock. Their bite is also dangerous for people and kids with various allergies, especially allergies to bee stings. The centipedes you see quickly crawling on your walls on in your sink are called house centipedes and are usually very small and not so dangerous. Long living critters, centipedes can survive normally 2-3 years. If they lose legs, they are able to regenerate it and grow it back. They live in moist, warm, dark places. They can be found in soil, under leaves, under stones, and wood logs. But you will also find them in places like your kitchen, bathroom, and basement, where there is humidity and warmth. They come out at night when they go hunting for food: ants, cockroaches, silverfish, spiders, and bed bugs. Usually, they don’t invade your house by hundreds. So, if you kill a couple of centipedes in your house you probably killed them all. However, in places with a lot of humidity, especially in the basement, they thrive and multiply. Let’s see how to get rid of those fast-walking, hundred-legged critters wherever they are in your house. The easiest way is to go to the cause. Well, the cause of your centipede invasion is humidity. If you get rid of moisture in your house, all the centipedes will disappear. Their bodies can’t survive dryness. So, get rid of humidity and you get rid of centipedes indirectly. How to get rid of centipedes in the basement? Use dehumidifiers. Also, install dehumidifiers in the house, too. Repair your roof, if there’s rain leaking on the walls of the house. Keep the bathroom dry, wipe off the water on the tiles after you shower. Centipedes survive on eating insects from your house like spiders, ants, bed bugs, and silverfish. If they have multiplied and thrived in your house, then your house not only has high levels of humidity, but also lots of other critters they can eat. Make their food vanish first and they won’t have what to eat in your house anymore. They will either leave or starve to death. Any outcome works great for you. So, look for natural remedies to get rid of spiders, ants, bed bugs, silverfish and other insects that you notice in great number at home, and you will strike two birds with one stone. Also, most natural repellents for other home insects will kill centipedes, too. Inspect your house and seal these entry points. Cover drains in your basement and bathroom with screens. Repair larger holes or cracks in the building. If you leave laundry laying on the floor, stuff piled up in your basement, old things in the attic, know that these are perfect hiding and living places for centipedes. Getting rid of the clutter in your house is one step further to get rid of centipedes. Clean around your house as well, especially the space immediately surrounding of your house (moist, dark, and warm), where centipedes may thrive. Reduce humidity – If you have irrigation sprinklers let them work in the morning, to allow the soil to dry during the rest of the day and night. Also, reduce the action range, so they don’t sprinkle close to your house or on the walls. Remove leaves, wood, compost, and building materials piled up close to the house. If there is ivy growing up on the exterior walls of your house, you may consider taking it down, as centipede love to live in there. When there’s nothing you can do about humidity as you live in a humid and warm weather most of the year (like Florida) and centipedes are too many inside and around your house, consider using food grade Diatomaceous Earth, a fossilized plankton. It is non-toxic to humans, pets, and the environment. Spread DE powder in the places where you have seen centipedes. It actually cuts the outer layer of their body and causes them to dry and die. So, don’t put it on damp surfaces, as it gets wet and will not cut the little fast-walking invaders. Cayenne pepper is a great natural home centipede repellent. Capsaicin, the main natural compound in the cayenne pepper that gives it that hotness, is also an insect repellent. Spread cayenne pepper powder in the places with centipede activity. However, if you have pets and small kids, it’s wiser if you avoid using this hot powder so you won’t harm them. Neem oil is an antimicrobial, antibacterial, antiviral, and antifungal natural remedy with pesticide properties. It is so effective that it is even used in agriculture, as a biopesticide. Neem oil disrupts centipedes’ hormonal system, so they stop feeding and multiplying. This is one of the best home remedies for centipedes. Learning how to repel centipedes and other insects with this natural oils is easy and it is also good for the environment. Cedar essential oil is not only a nice scented oil with many therapeutic properties for people, but it also has powerful pesticide effects against centipedes and other insects. Since it’s not water-sensitive, cedar oil is the perfect solution for humid spaces like basements, bathrooms, kitchens, brick walls, and around the house. If you’re a compassionate person by nature or have watched Seven Years in Tibet with Brad Pitt and have been so impressed that you swore to no longer kill any creepy crawlies ever since then, let’s use a compassionate method. Capture them in a jar with a piece of paper and take them outside, far away from your house. As you can see, there are a couple of methods that teach you how to get rid of centipedes using natural remedies that not only repel (or kill) the many-legged monsters, but are also safe for you, your family, your pets, and the environment. Did you have centipedes in your house? How did you get rid of them? Let us know in the comments below.